AVC Support - MPEG-4 using H.264 & AAC codecs. Scaling & Cropping Features - For flexible display of source content on the decoder output. Standard Ethernet Network Operation - 10/100/1000Mb. Decoder-Integrated Network Switch - Allows for KDS-DEC3 daisy chaining and network extension. Audio Support - HDMI or analog. Streaming Support - Unicast and multicast through RTSP (Real Time Streaming Protocol). KDS-EN3 Manager Software - Allows remote management of the KDS-EN3 network including auto-detection and discovery of KDS-EN3/KDS-DEC3 units on a subnet. Fail-safe Video Playback - When a decoder loses its connection to an encoder. 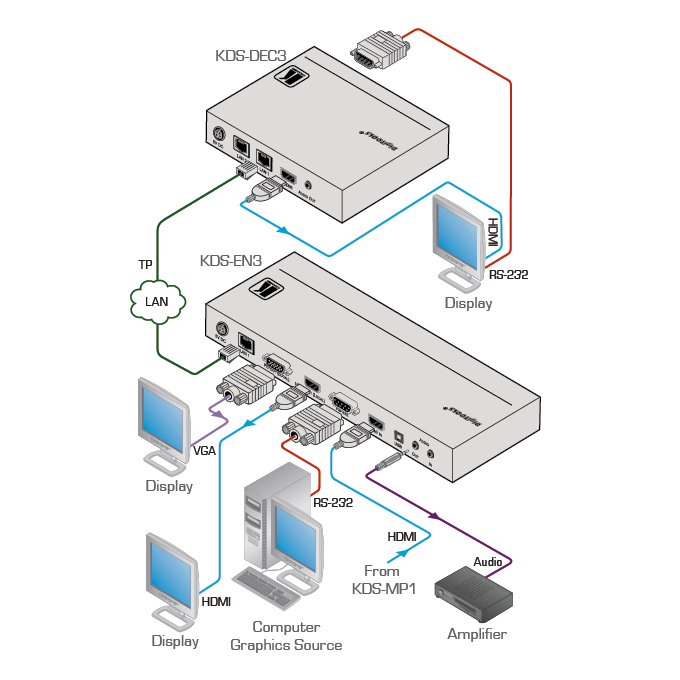 RS-232 Virtualization - From encoder to decoder. 1 unbalanced stereo audio on a 3.5mm mini jack. 1 RS-232 on a 9-pin D-sub connector. Resolutions Up to 1920x1080p60 and 1920x1200(60Hz). Compression Standard H.264/Mpeg4 Part 10 (AVC). Bit Rates 100Kbps to 25Mbps.